DANANG, Vietnam—BaSao Investment recently installed a robust, all-weather HARMAN Professional Solutions audio system at Sun World Bà Nà Hills. Situated high in the Trường Sơn Mountains, Bà Nà Hills is one of five Sun World resort destinations in Vietnam operated by Sun Group. 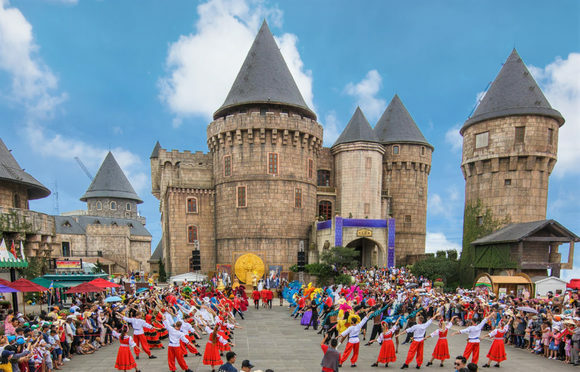 The resort is built around a hundred-year-old French village accessed by the longest cable car system in the world, with attractions including high-end lodging and dining, extravagant gardens, a wax museum and a theme park based on the works of Jules Verne. For their daily outdoor carnival shows, Sun Group required a robust audio system that could deliver high-quality sound and complete crowd coverage, while also withstanding inclement weather. To meet these goals, BaSao Investment deployed an end-to-end HARMAN audio solution incorporating JBL all-weather loudspeakers, Crown amplifiers, dbx DriveRack processors and Soundcraft Si digital mixers. BaSao selected JBL AW526 all-weather loudspeakers for the installation, which feature Progressive Transition waveguides for impressive 120° x 60° coverage. 500-Watt AWC15LF subwoofers extend the system’s low-frequency capability to 45Hz with the same weather-resistant construction. Crown MA 5000i amplifiers power the system with onboard analog signal processing and built-in network connectivity. For mixing tasks, BaSao took advantage of the Soundcraft Si Expression 1 console’s 64-input expansion slot to accommodate the festival’s many performers. They also chose the dbx DriveRack VENU360 loudspeaker management system to optimize and protect the system with advanced AutoEQ and AFS algorithms. "HARMAN Professional Solutions is pleased to be associated with Sun World Bà Nà Hills and glad to help bring the carnival festivities to life with high-impact audio," said Ramesh Jayaraman, VP & GM, HARMAN Professional Solutions, APAC. "We thank our country partners BaSao Investment for using HARMAN products to meet the client's unique requirements and create a high-energy carnival experience."